Well into the 18th century, astronomers mainly used long refracting telescopes, designed around a meticulously shaped glass lens. However, other telescope designs offered a way to avoid some of the defects that could not be avoided in refractor lenses. In 1668, Isaac Newton devised a reflecting telescope. Instead of a lens, it used a single curved main mirror, together with a smaller flat mirror. In the next century, huge instruments descended from Newton's design turned out to be especially useful for studying very faint objects, such as the dim patches of light known as nebulae. The studies that the new and bigger tools made possible led to fundamental changes in our understanding of the universe. Scholars knew that you could get magnification using a variety of combinations of lenses and mirrors. A number of scientists speculated on telescopes that used mirrors, fueled by an increasingly refined theoretical study of optics. One landmark was the Dioptrique of Ren� Descartes, appended to his Discourse on Method of 1637. Here Descartes addressed the problem of spherical aberration — a slight blurring of any image that was created by a lens or mirror curved like a segment of a sphere. A Scottish mathematician, James Gregory, proposed a new design for a reflecting telescope in his 1663 book Optica Promota. Gregory's theoretical design featured a primary mirror with a parabolic curvature. It would reflect light to an elliptical secondary mirror, which reflected it back down through a hole in the primary to the astronomer's eye. The Gregorian design, along with the superficially similar Cassegrain design (named after an obscure 18th century Frenchman), would eventually become the predominant design for reflecting telescopes. But at the time these designs were proposed, opticians could not polish mirrors in curves that were not spherical. Some London opticians tried to produce reflecting telescopes, but failed. The most significant development came when Isaac Newton, after his groundbreaking research in light and optics, concluded that refracting telescopes would always be defective. For any lens would, like a prism, disperse the colors of light, in direct proportion to the refraction. The result was chromatic aberrationthe image of a white star would always show a smear of colors. So Newton turned his attention to the design of a practical telescope which would use a mirror to collect starlight. Seeing therefore the Improvement of Telescopes of given length by Refractions is desperate, I contrived heretofore a Perspective by Reflexions, using instead of an Object-glass a concave metal. Newton presented his design to England's Royal Society in January 1672, where it aroused great interest. He had succeeded in making a mirror with a spherical curvature, slightly less than 1� inches in diameter. The mirror was made of a copper-tin alloy, to which Newton had added a bit of arsenic to make it easier to polish. It had a magnification of about 40. Above this primary mirror Newton placed a small flat secondary mirror at a 45-degree angle, to reflect the light into an eyepiece mounted in the side of the telescope tube. Although Newton's telescope stirred interest it remained largely a curiosity. Others tried but failed to grind mirrors of regular curvature. Adding to the problem, the metal mirror tarnished and had to be repolished every few months, which could affect the curvature. And although Newton was convinced his design was superior to a refractor, the small size of his instrument concealed the defects caused by its spherical curvature. Some further experimentation was done with reflecting telescopes, but little progress was made until the 18th century. John Hadley was born near London. He showed a talent for inventiveness from an early age, and became a Fellow of the Royal Society at the age of 35, in 1717. Around this time, with help from his two brothers, he began to experiment with the grinding and polishing of metal. He used speculum, a combination of bronze and silver used for mirrors since ancient times. By 1721, he had succeeded in making a 6-inch-diameter Newtonian telescope with a focal length of 62 inches. Hadley managed to polish his metal mirror so that it had an approximately parabolic shape, avoiding the distortion in previous telescopes with spherical curves. Like Newton, Hadley first showed off his telescope at a meeting of the Royal Society. Records from the meeting say that it was powerful enough to "enlarge an object near two hundred times." Just as important as the telescope's mirror was its mounting. Telescopes have to track objects across the sky as the Earth turns. To achieve this, Hadley developed what is now called an altitude-azimuth mount. The altitude axis lay parallel to the horizon, and the azimuth axis pointed perpendicularly. With an alt-az mount, an astronomer had to move the telescope along two axes simultaneously to keep an object in view, but this was compensated by its relatively compact size. 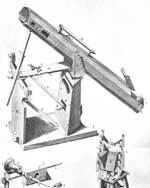 Hadley's telescope was tested by two English astronomers in 1722 by observing Saturn. They saw four of the planet's satellites (the largest in transit across the face of the planet), and the divisions in Saturn's rings. Although they judged its images not as bright as those in Huygen's 123-foot aerial telescope, Hadley's design was far easier to use. Before he died in 1744, Hadley continued to experiment with different ways of polishing mirrors for telescopes. No less important, he worked on ways to test the results, for you cannot polish a curve better than you can measure it. It was a mighty bewilderment of slanted masts, spars and ladders and ropes, from the midst of which a vast tube�lifted its mighty muzzle defiantly to the sky. William Herschel, a musician who moved from Hanover to England and turned to astronomy, directed his first efforts toward building refracting telescopes. But the lengthy tubes annoyed him (he made one as long as 30 feet), and he turned his attention to mirrors. By the late 1770s, Herschel had built several reflectors. His most successful one had a 6�-inch mirror and was 7 feet long. He used this telescope to compile the first substantial catalog of double stars and, in 1781, to discover the planet Uranus. This discovery brought Herschel royal recognition — and an annual salary of �200, which allowed him to practice astronomy full-time. Encouraged by his success, Herschel spent the next several years perfecting an even bigger telescope. 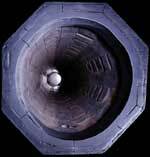 It featured a mirror nearly 19 inches in diameter, encased in a tube 20 feet long on an alt-az mount. Like other early telescope mirrors, it was made of metal (mostly copper and tin) and tarnished quickly, so it had to be repolished often. The base of the telescope could be opened and the mirror easily removed. Another mirror was always on hand to use while the first was being polished. 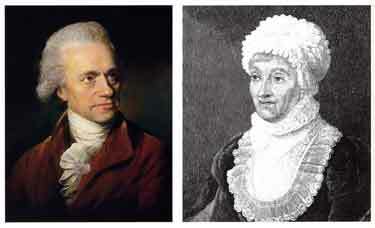 William Herschel did his observations with the assistance of his sister Caroline. The telescope's eyepiece was mounted at the top of the tube, so Herschel observed from a platform that could be raised or lowered as needed. Caroline sat inside the house nearby at a window. When William signalled by pulling a string, she would open the window and record her brother's observations as he called them down to her. Observing was arduous. Herschel went out whenever possible, even in bitter cold. One night, while using an earlier telescope, his ink froze in its bottle and his best mirror "crack'd into two pieces." Observing from the high perch was also hazardous. Caroline recorded that she and her brother were involved in a "pretty long list of accidents� which were proving nearly fatal to my brother as well as myself." Looking down Herschel's 20-foot tube without its eyepeice lens. In 1783, using the 20-foot reflector, Herschel began to search the night skies for the dim patches of light in the skies called nebulae. By 1784, he reported that his telescope could resolve individual stars in nebulae previously identified by the French astronomer Charles Messier and that he had also found hundreds of new nebulae. MORE on Herschel's 20-foot telescope from the Smithsonian. [Herschel] has discovered fifteen hundred universes! How many more he may find who can conjecture? 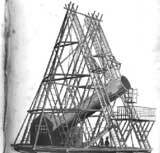 Herschel's 20-foot telescope was the best of his instruments. In 1785, he began to design one twice as large, which could collect four times as much light. He began using this 40-foot telescope in the fall of 1789, and quickly found two more satellites of Saturn (Mimas and Enceladus). However, the long telescope tube tended to bend, while the frequent need to re-polish the main mirror limited its usefulness. Herschel used this cumbersome giant only occasionally, preferring the more manageable 20-foot instrument. As he noted, "to look through one larger than required is loss of time, which in a fine night, an astronomer has not to spare." Herschel made his last observation with the 40-foot telescope in 1815. His journal notes: "Saturn was very bright and considerably well-defined� the mirror is extremely tarnished." Such tarnishing was one of several severe limitations for large reflectors, and over the next several decades their popularity declined. Advances in optical design and glassmaking were revitalizing the refracting telescope as a tool for research. *Click on images and links above for more information.